Adelaide Blake was the third daughter of Nicholas Mahon Power, landlord of Faithlegg from 1819 to 1873. His youngest child, she was forty before she married John A Blake MP. Part of her legacy was the establishment of the Reading Rooms, Cheekpoint and the stained glass window behind the altar at Faithlegg Church. Their story is a love story of the Victorian era and the strict conventions of the time. Adelaide was the fifth and youngest child of Nicholas and Margaret Mahon Power who moved to Faithlegg in 1819. Adelaide would have grown up in the area and she was schooled like all the children, at least initially, in the school room which is now a dining suite at Faithlegg House Hotel. John Aloysius Blake was born in Waterford City (Gladstone St) the son of a merchant and landowner, and the family home was in O’Connell St. Blake was elected to a position of mayor in 1855 when he was not yet thirty and was reappointed to the position for three years running. 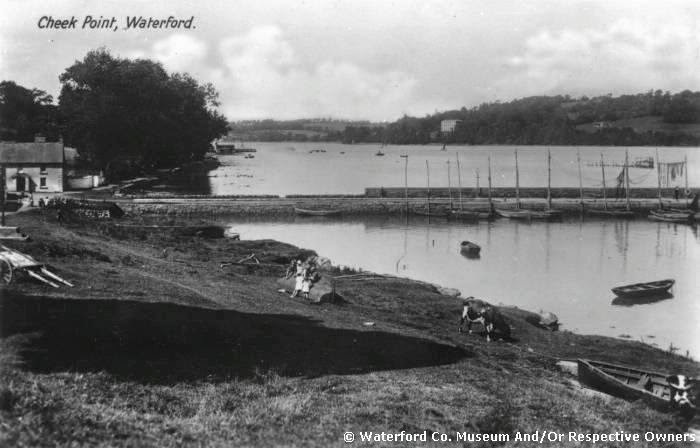 The current people’s park in Waterford was constructed during his time, and thanks to his foresight. In 1857 he was elected to parliament in Westminster as a liberal, and represented the city until 1869. He stood down at this point as he was appointed as Inspector of Fisheries. He served in this position until 1874 when the government of Gladstone fell. He seems to have taken to his duties with some energy and was an ardent supporter of an Irish fishing industry (something we have never had much vision around at official level). Following this, he represented the county from 1880-1884 and finally he represented Carlow from 1886-87 cut short by his untimely demise. An obituary at the time gives a sense of his passing. I don’t know when John and Adelaide first met but it could have been at Faithlegg at one of the many balls that it was fashionable to attend in this era. It could also have been at any of the fine houses that were sited in the city and county. Mind you it could just have easily been in Dublin, where Adelaide’s mother hailed from, or perhaps the summer season in London, to which all the upper classes aspired, and to which Adelaide doubtless belonged. In any case the two fell in love and courted for many years. However, Nicholas Mahon Power was not pleased with his daughters suitor and refused any marriage proposals. It was not until her father died in 1873, that her brother Patrick, following a period of mourning, consented to allow the marriage to take place. Adelaide was 40 years old (8 years younger than John A) when the two were wed and lived in Dublin or London, depending on her husbands schedule. At the time the age was too great for children to be considered. 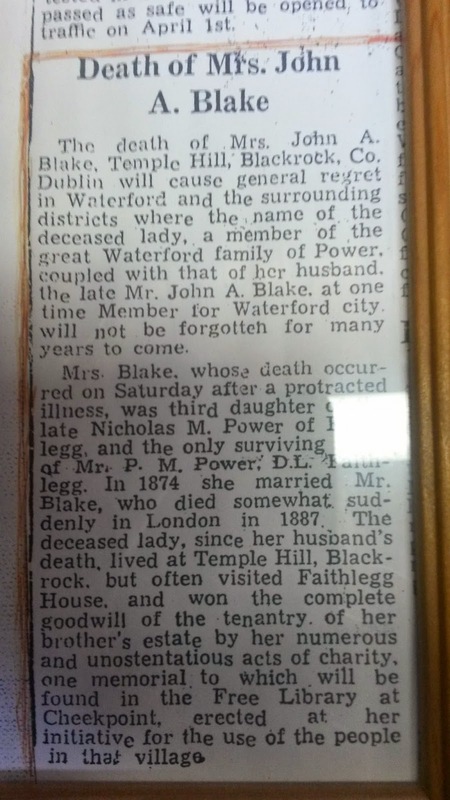 It must have come as quite a shock for her to loose her husband in his 61st year in 1877. He died in London and it was there that Adelaide had him buried, in Kensal Green Cemetery marking his grave with a Celtic cross. The stained glass in the Faithlegg Church (which her father had built circa 1823) was also commissioned and installed by Adelaide in his memory. Adelaide continued to live in Dublin but was a regular visitor to the Faithlegg area according to locals. She resided at Temple Hill in Dublin and one of her interests seems to have been historical studies and she was a member of the The Royal Society of Antiquaries of Ireland in 1896 and again in 1900. She finally died herself on 20th Feb 1911 in her 77th year. Her lasting legacy to the area is not just the stained glass window or indeed her name on a meeting room in Faithlegg House Hotel, but also the Reading Room in Cheekpoint, which I’ve described before. There a copy of her obituary hangs on the wall, as does her portrait. Most of the information used in this piece is drawn from the work of Julian Walton’s On This Day Vol 1 pp 204-5. Thanks also to Pat Murphy Cheekpoint for much of the local information. It was a March evening in 1993 and my brother Robert had joined me with Pat Moran and Dermot Kavanagh as they sorted oysters on the back of a trailer in the Mount Avenue car park. It was promising to be one of those frosty evenings, dry and cold and very still. We had chipped in to help the lads grade the oysters in terms of shape and size, some going to a fish box for dumping, others into buckets to be bagged up for replacing on the trestles on Woodstown beach to grow on. As we worked and chatted away Pat heard an odd sound and stopped work to investigate. We gathered round him to see what was going on. Nothing as it happened for a short time, but Pat was watching with a keen fisherman’s eye at a point across the river at Great Island Power Station. Suddenly a great spout of water shot into the air, whilst at the same time a dark form came into view. It was coming from the waterline near the mud below the jetty of the power station. Robert ran to get binoculars off our father and when he returned and looked through them, he was puzzled. He handed them round and we each took a turn, and all took turns speculating. We were joined by our Father Bob who was of the opinion it was a whale, and Anthony Rogers who had seen something similar to a whale in the river earlier in the day, but had dismissed the idea. Always a man of action Pat announced a sortie, and we ran to get our boots and joined Pat on the Mount Quay where his boat was moored and Robert, Pat and myself headed over in the direction of the disturbance. Approaching the scene, we were cautious to keep a safe distance. A grey shape like a torpedo was lying in the water just off the mud bank. There was a small fin showing well back. There was a dividing line running the length of the body, white beneath and grey above. Folds of blubber were lying in the water beside, where it was pressed to the surface by the grounded body. What looked like a blow hole was facing us. It could only be a whale!As we stared at the hulk of a body we heard a whoosh of air emitted and then the air was filled with a distinctive fishy smell, but it hadn’t come from what we thought was the blow hole, which turned out to be an eye socket, and when he opened the eye it was a dark pupil surrounded by a yellow pupil and seemed to draw us all in. The whale was about ten feet outside the waterline and inside the that, about thirty feet away, was a thin seaweed strip of shoreline which then raised up an embankment of ten feet beyond which was the site of the power station. As the tide was rising (coming in) the distance was narrowing all the time. Pat put the boat ashore and Robert jumped onto the mud and walked down towards the shape. In length it must have been ten feet that we could see shaped like a gradual hill in the water. Robert had brought a pole from the boat to keep him steady on the soft mud. He approached and was again drawn to a very large eye that seemed to be watching him. Meanwhile we had pushed off and were floating close by. As Robert approached from inside, the snout of at least seven feet raised out of the water. It brushed his knee as it rose. Another step and it would have risen between his legs! Robert stumbled back, with I guess a mixture of shock and disbelief. Next moment a tail broke water at least ten feet away from the body and began to splash and churn water. Shocked ourselves by the size and might, we hardly noticed that a ton of water had covered us and we were wet to the skin. At this point a car turned on the roadway on the embankment and flashed a light at us. Robert walked in to join them. On his return he was able to say that the incident had been reported and that a team was being dispatched from some organisation from Dublin who would be experts and who would take charge. Discussing it, we greeted the news with some relief but said they had better hurry. We realised that as the tide rose on the mud, each time the whale started to struggle it was to push itself further onto the mud. The nature of the beast was trying to free itself, but was in fact further beaching and getting further away from the safety of deep water. Not alone was it pushing forward, but at times, maybe in frustration, it’s whole body turned and turned, an incredible feat for such a heavy creature. Pat was of the opinion that if we could get some rope around the snout that maybe we could hold the creature back and make it easier to be refloated. So Robert hopped ashore with instructions to keep well back and we returned to the Mount Quay for a length of rope. On our return however Robert was dejected with the news that the cavalry had rung to say that they would be along in the morning when they could see what they were doing! Apparently they were of the opinion that the whale hadn’t a chance and it would be futile to try. We knew that once the tide started to drop that the Whale would be beached and the weight of its body would crush it to death. The cavalry would arrive to a corpse. Pat was of the opinion that if we could get the rope around the long snout of the whale we might be able to swivel him about on the soft mud. He had noticed that the nature of the beast was to push forward, and his plan made sense, however unlikely. In the deepeening gloom we set about paying out the rope which Robert then tried to lasso around the snout . Several times he succeeded but as we began to put weight on it as we towed away at an angle from the whale, the rope either slipped off or the whale twisted or turned out of it. We then changed tack. We kept one end in the boat while Robert took the other. We were upriver and Pat steamed out around the whale whilst I held the rope and we took it downriver where we met Robert. We took the other end from him and then hauling on both ends of the rope drew them together and managed to get them down onto the head of the whale, significantly further than we had managed before. We twisted the ends of the rope around the after thwart and Pat gunned the engine. Miraculously the rope held and we could feel the tension take on it. Measuring our progress against the lights on the shoreline we could see that we were inching along. Pat slowly altered course bringing the bow of the punt further away from the shore but suddenly the whale reacted. In stead of helping he went against us. He started to pull away from us and not having any luck, he reacted by turning over and over and somehow the rope snagged. Rather than us pulling him, the whale, just like a bucket being pulled up out of a well on an axel, we were hauled into the path of the whale. Too late I reacted by loosening off the rope, as he turned we were dragged into him, then up onto him and the engine was broken off the stern of the boat. Pat managed to hold on to the engine as we mounted the top of the whale, but for some reason just as we were about to be tossed out into the river, the whale stopped. the punt slipped back into the river…we were safe, but my legs were like jelly and to be totally honest I wanted to go home. But then we had a bit of luck. The rope had stayed snagged. And although the engine was damaged we now had the rope firmly placed around the body of the whale, it had even shifted further onto the body. Pat had another idea. We retrieved a further length of rope and with it I went ashore to Robert. He had gone up to the men from the power station and they had managed to find extra rope. We tied the ends together and then joined them on the embankment. I didn’t know any of them but explained briefly what had occurred and asked would they be willing to try and haul on the rope and it might just turn the whale away from the mudbank. All were willing and between us we lined up like some berserk tug of war team going up against a ten ton truck. Someone suggested getting a car to tow it, but we were worried about doing more harm and so decided in the first instant to try with manpower. We began to heave and I have to say I was crushed when the rope just simple came towards us and I was convinced that it had come off the whale. In the dark we could not really see. But then as painful as feeling we had failed the whale, came a feeling of pure joy. The rope hadn’t come away, Pat’s plan had worked. In the gloom, with only the lights of the station, we could make out the tail of the whale splashing in the water and then the rope started to slip from our hands and incredibly he headed out into deep water. A few weeks later the rope we used was recovered by Paddy Duffin when fishing for Salmon down on the mud. For weeks after we listened to news reports etc but no mention of a dead whale were heard. Although we would never know for sure that the whale was saved, the only thing we can know for sure is that he didn’t die on our watch. I never did find out if the cavalry arrived. No one seemed interested in our story. But I guess had it happened in daylight the national media would have been there, as would the cavalry…but I wonder would our whale have survived to tell the tale. Our best guesstimate was that our whale was 30 feet minimum. In referring to the reference books we considered it to be either a Fin or a Minke whale. Maybe if the experts had arrived we might have known! also of strategic importance to the Normans. both have seen several upgrades and additions down the years. More about the quay here. within the protective casing of a mild steel girder frame with cross trusses. constructed in Ireland and the bridge the last major piece of infrastructure. Previously we covered the planning and construction of the bridge, its opening and eventual closure. over 170 acres of land. source of bait for the summer Eel fishery. unique not just in Ireland but also in Europe and most probably the world. Snowhill was, until recently, a mystery to me. As a child I assumed it had to do with snowdrops, the late winter/early spring blooms that lift your spirits and reassure you that warmer, longer days are on the way. Later I was told it’s origins related to an old mansion which was sited there, but infuriatingly no more. It came as a lovely surprise one day to be in the Waterford County Museum an find the photo below. 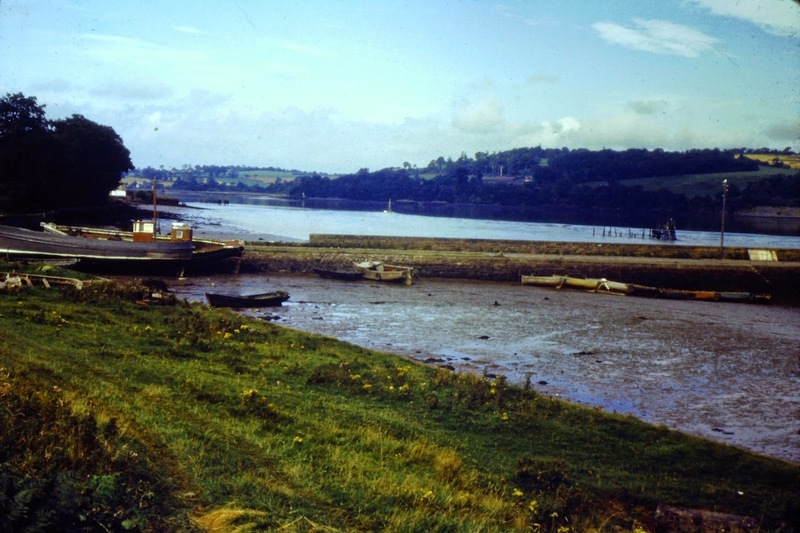 Its an old scene of Cheekpoint and it has Snowhill in the distance and the mysterious house. I was so intrigued by it, I bought a copy and it still hangs from our living room wall. But the Snowhill placename originates from a Cromwellian family, the first of which was a man called John Snow who was described as a “master tentmaker to the army in Ireland”. I can only speculate that he received the land as a gift, similar to the Bolton’s of Faithlegg, for his part in the Puritan invasion. The last of the Snow family was Elizabeth and she married a merchant by the name of Patrick Lattin1792 but financial problems followed. It was sold to help pay of the debts in 1808. In 1808 it was purchased by the Power family who would later have first cousins on the opposite banks in Faithlegg & Cheekpoint. 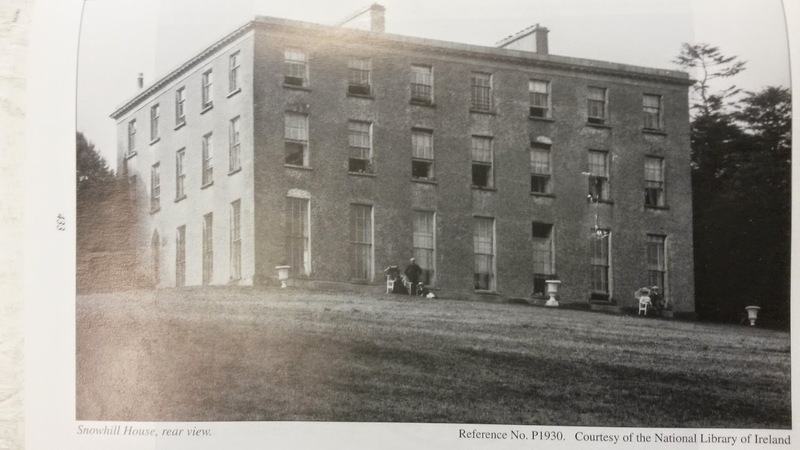 The purchaser was one Nicholas Power and in much the same way that I think Faithlegg House was bought as a wedding present for Nicholas Mahon Power it would appear his cousin Nicholas purchased Snowhill for his son David and his Cork born wife, Elizabeth Nash. The Powers retained the house until 1953 but under a new name – Power Hall. Alas underinvestment had significantly undermined the structure and the house was pulled down in 1955. Nowadays only the demesne walls and outhouses remain. 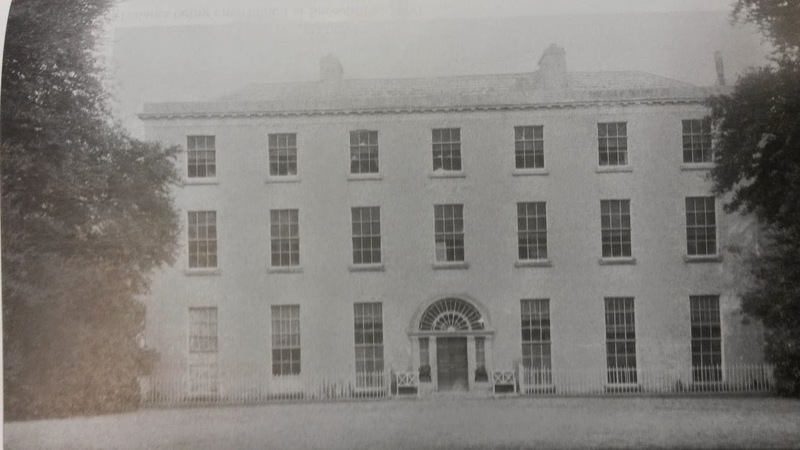 And despite the fact that Faithlegg House seems to have been a grander house, it had nothing like the connection with the River Suir. Snowhill had a very fine quay – L shaped with a find breakwater of poles to the eastern side. This was a deepwater quay and although the ebb tide meant the dock dried out was still a very safe haven. Snowhill quay still has hints of its once significance and to walk up from the quay towards the house highlights how beautiful it must once have been. An old boat house remains, roof gone and doors no more, but only begging to be refurbished. The grand old trees, many fine and rare specimens of oaks and limes still adorn fragments of the old demesne. Now a working farm, it appears to me like some once grand sailing boat now reduced to a sailing hulk, moored away on a redundant quayside. Julian Walton mentions another family in connection with Snowhill in his recent book – On this day Vol I pp154-55 which will require further study.